OH Christmas Tree.. OH Christmas Tree!! Tonight Russ and I went and bought our Christmas tree.. I wanted a big huge really green fluffy one, and so I picked out the biggest greenest fluffiest one there and obviously forgot how tiny our living room was.. So now its nothing but tree! 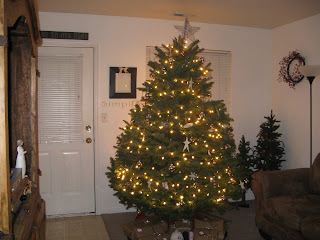 And we did not really have enough ornaments but I think it looks pretty good! This picture does not do it justice it is HUGE.. 7 feet tall and 4 feet wide! Our tree stand was too small for it so we had to go buy a bigger one. Every time we have set up our tree since we have been together something breaks, the lights will not work, or we forget to buy something. So to get our tree set up usually takes about 3 trips to Walmart! Someday we will get this whole tree decorating thing down! YEP, Today is definitely one of those days.. Too bad they do not have these at Beans and Brew!